My wife and I were looking for a home for the next stage of our lives and, after searching for months looking at available housing, we decided our best option was to build. We had a good idea of what we wanted but no concrete plans. We found and worked with more than one builder. Tom Fuller (TA Fuller Homes, Inc.) showed us homes he designed and built, floor plans for several models and gave us contacts for referrals. He listened to what we said and was willing to modify his plans to accommodate our wishes. He made (excellent) suggestions based on his considerable experience. The result is the home we had hoped for. the build with minimum delays bringing the project to completion on schedule. 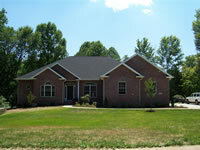 We heartily recommend t A Fuller Homes, Inc. as a builder. 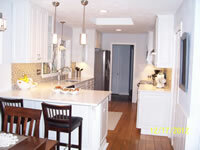 I hired TA Fuller homes to do my kitchen remodel because they came highly recommended by a couple different companies. I was very impressed with Tom Fuller’s attention to detail and perfectionist attitude when it came to what he expected from his team. Tom helped me take my 60’s kitchen into the 21st century. After we decided to renovate and add a room on to our home instead of selling, the first thing we agreed upon was to get a contractor who understood what we needed, would help us through the process as well as be heavily involved in the day to day construction. Without a doubt, Tom Fuller exceeded all our expectations. Tom truly cared about our project and did not settle for anything less than perfect craftsmanship. Even when we had side projects that we decided to do on our own, Tom was very helpful in making sure we had the right sub-contractors for the job and offered suggestions when we weren’t sure what to do. Without a doubt, Tom, is the best contractor (by far) that we have ever worked with and treats every job as if it were his own. We can’t thank Tom enough for all that he did to make our room addition exactly what we wanted. He delivered on time and in such a professional manner. One of my favorite things about Tom is how neat and clean he kept the job site. 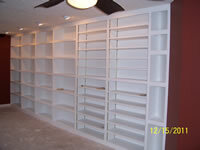 If you are looking for a contractor for a new home, remodel, or new addition . . . he is your guy, don’t even consider looking for someone else. Building a house is a stressful adventure so having the right contractor is vital. 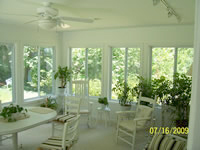 For our family the process of building was a truly pleasant and enjoyable experience. We have Tom Fuller to thank for that. Working with Tom was, without a doubt, a positive experience. Tom’s honesty and credibility created an immediate trust. He listened to our needs, offered helpful but not demanding advice and was always willing to make the changes that we desired. 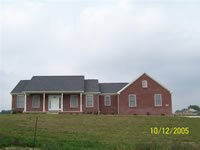 His drafting skills and his well organized work schedule insured the completion of our house in a timely manner. He has remained in close contact throughout this first year and has always responded quickly to any issues or questions that we have had. 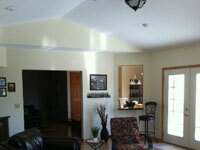 If we had it to do over again, we might change a wall color or a window size, but we wouldn’t change contractors. We wouldn’t hesitate a moment to work with Tom Fuller again. This is to heartily thank you for the very successful construction of my marvelous custom home. The first-rate construction, inspired design, sound advice, and patient personal interaction with me were all deeply appreciated. I have heard nothing but raving comments about the house from both friends and strangers. 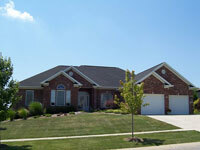 If there is a better or more ethical builder in the Bloomington area, I would be very surprised. Ruth and I wanted to express how happy we are with our new addition. You were able to take our vision for a garage and dining room extension plus a new porch and turn them into a working set of plans that met our highest expectations. The finished product looks like it was part of the original house. We appreciated your expert handling of the different trades and the fact that you made a determined effort to keep the house clean and reasonably private. 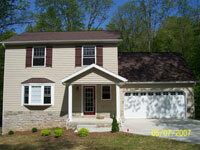 Your sub contractors were friendly and knowledgeable and did a professional job. Although the weather was an issue you kept us appraised of contractors’ comings and goings so that we always knew what was happening. Lastly, you anticipated our needs well enough at the contract signing that change orders were few and not very costly. We would recommend you to anyone considering building a new home or adding on to an existing home. As a first-time home builder and a single woman, I was very reluctant to contact contractors about building my home. I had three recommendations from a friend and the first contractor I meet with was Tom Fuller. I felt right away an immediate trust and knew this was the person I wanted to work with. He met me at my property and I told him what I wanted and what my budget was. He explained what he could do and came back with a price I could work with. The house plan had everything I wanted and more. I did everything you are advised not to do and went with Tom without contacting the other two contractor and do not regret it. I just knew he we the right one for me. During the construction, Tom was always available to me for questions and concerns. He was at the build site and kept thing running smoothly. I highly recommend T.A. 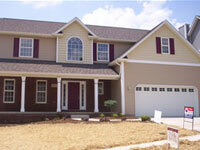 Fuller Homes, Inc. It bought me peace of mind during what I thought would be a stressful process. I am in my new home and I love it. We want to thank you for the wonderful job you did constructing the addition to our house. From start to finish you were an absolute professional. All of your sub-contractors were friendly and hard-working. Thanks to your attention to detail, we had virtually no problems throughout the entire process. And best of all, the addition was finished on time! We will happily recommend you to anybody looking to build a new home or an addition to an existing home, and we will definitely call you for any future construction we might do. I’m the second owner of a house with The Jackson plan. It is a beautiful home, designed with many extras (dryer has both gas/electric hookups, central vacuum system roughed in, HVAC on both levels, etc). It’s the fifth house I’ve owned, so I was quite surprised during the pre-purchase inspection — the inspector raved about the home. This is the only home purchase/sell with which I’ve been involved that had no list of fixes to be negotiated prior to closing. The house is seven years old and still in perfect condition. Early 2004, my wife and I decided to build a new house but we did not have any idea as to who to use as our builder. So we started going to open houses to look at the workmanship and design. After looking for a few months, we attended the Bloomington Home Show and met a few of the builders in the area. We were looking for a custom builder, one who did not build a lot of homes at one time, designed homes from scratch, and had high quality. We met Tom Fuller for the first time and really enjoyed what he had to offer in communication, quality, and design style. We toured a couple of his homes and they were well above the quality level and detail of many of the other builders. We showed him a house plan that we liked but needed modification. Tom took our ideas and drew up plans for our new house. Tom valued our input and after a couple of meetings we had our plans exactly as we wanted them. We broke ground late 2004. Since this was the first time that we built a house, we had a lot of questions throughout the process and Tom always made time for us. After a few weather delays. we moved into our new house in March 2005. The quality level was better than we expected. An example of this high quality standard was during the installation of the kitchen floor Tom noticed that the tiling was pulling away from the floor at the edges. He contacted the subcontractor and had the floor removed and corrected before we had time to complain about it. We would use Tom again and we recommend Tom to all our friends who are in the market to build a new home.